Is your excess office furniture irritating you? WE ARE THE PAINLESS SOLUTION. 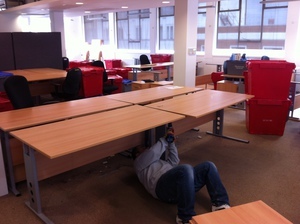 Whether you are looking to clear out a small office or one with hundreds of occupants, RBF has the experience to cope. Our team of clearance specialists can help remove the headaches by managing every step of the process. Typically we start our office clearances at offices of about 25 people and above unless the furniture is something more specific like executive furniture, reception furniture or tables. Whether you are a multi-national or a small business we have dealt with similar clients and are flexible enough to work to your requirements. RBF is committed to avoiding landfill whereever possible.